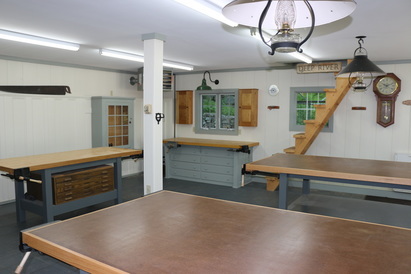 I designed and built this country barn workshop in 2001. 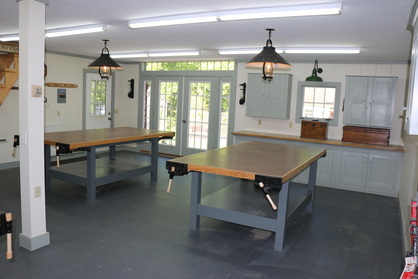 It has three large workbenches that can accommodate ten students. A nine foot wide French door and five awning windows let in fresh air and natural light. 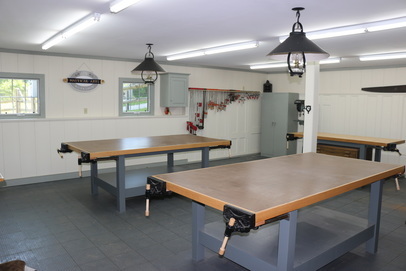 The shop has ample overhead lighting along with heat and air conditioning. To give support and comfort while standing, the entire shop floor is covered with rubber anti-fatigue tiles. Hand-made Windsor stools provide seating for every student.